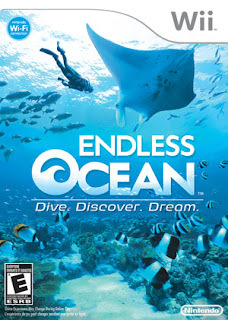 Here' s another innovative but I'm pretty sure boring game for the Nintendo Wii--Endless Ocean. The game is mainly designed for casual gamers and more like a virtual scuba diving excursion rather than a game. Endless Ocean for the Nintendo Wiii will let you go on an undersea adventure and explore vast ocean so you can look for different animal species, check out coral reefs, and explore shipwrecks and war ships...God! Even describing this game makes me sleepy. I don't know why they made Endless Ocean a game, I mean, if you just want to explore the sea just turn your TV to the aquarium channel--simple!. I guess it would appeal to the curious and scuba diving fanatics or a game to pass the time but for me, I'd probably be asleep two minutes into the game. Underwater scenes always had that effect on me. IS this a disk problem? Should we return the disK?? ?